PALM BEACH, Fla. – April 3, 2017 – Ferraris, Lamborghinis, Porsches and Aston Martins are among the world’s most coveted exotics roaring into Palm Beach during Barrett-Jackson’s 15th Annual Palm Beach Auction, on April 6-8, 2017, at the South Florida Fairgrounds. An unprecedented number of world-class, prequalified bidders representing several hundred million dollars in buying power will be converging at South Florida’s premier automotive lifestyle event. The prestigious buyers are likely to be among those attracted by the performance and romance only an exotic supercar can offer. Variations of the “Prancing Stallion” will be some of the most anticipated supercars in Palm Beach, including two that are among Ferrari’s most famous. Finished in Giallo Modena and powered by a 620-horsepower V12, this ’10 Ferrari 599 GTB (Lot #732) has a little over 7,100 miles. Lot #745 is a ’07 430 F430 Spider that offers supercar performance with the added thrill of enjoying both the sunshine and the melodic notes of its 4.3-liter DOHC V8 engine. For those whose tastes run more toward the charging-bull marque, Barrett-Jackson will auction two desirable driver-focused cars from Modena. 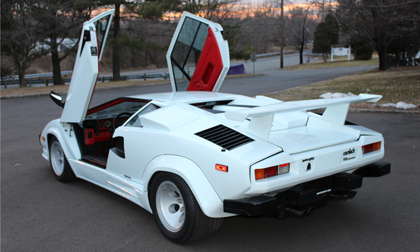 A white Lamborghini Countach 5000 QV (Lot #748) scheduled to cross the block is one of only 610 produced. It’s equipped with the coveted 4-valve engine, factory rear wing, U.S.-spec bumpers and 5-speed manual transmission. It’s had the same owner for the past 11 years, who recently had it restored and painted. Lot #744 is a red 1994 Lamborghini Diablo with black leather interior. Powered by a 5.7-liter engine with 5-speed manual transmission, it was fitted with a Reactive Performance exhaust. The Palm Beach Auction will not disappoint those seeking to own some of the most coveted Porsches. A beautiful Guards Red ’79 911 Turbo (Lot #736) is in excellent cosmetic and mechanical condition. The car has a black full-leather interior, power seats, sunroof and was recently serviced and displayed in the museum at Porsche Cars North America. An ’08 Porsche 911 Turbo Cabriolet (Lot #688) features light-blue metallic from Porsche’s premium paint-to-sample program, a turbocharged 3.6-liter engine and Tiptronic automatic transmission. With just over 17,000 miles, it is loaded with many options, including upgraded stereo and hidden radar detector. Originating in Gaydon, England, three elegant Aston Martins are headed to Palm Beach. One certainly fit for a secret British undercover agent is a highly desirable ’14 Vanquish (Lot #714) that’s finished in Skyfall Silver with a blue interior. A stunning example of the Vanquish, this British exotic features all of the factory options and rides on 20-inch alloy wheels with Pirelli P-Zero tires. Lot #439 is a ’08 Vantage convertible with only 37,000 miles. It features 380 horsepower with a 6-speed sport-shift manual transmission and factory power top. The final member of this trio is a ’06 DB9 Volante (Lot #403) with less than 19,500 miles, which was specially designed with a silver exterior and Bordeaux-colored interior with full mahogany trim. The 15th Annual Barrett-Jackson Palm Beach Auction will be broadcast on Discovery, Velocity and Velocity Canada during the three-day auction. For specific television schedules, please click here. For more information on becoming a bidder, follow the link to www.barrett-jackson.com/Bidder/Home. To consign a vehicle for the 2017 Palm Beach Auction, click here.